Pithy Art Blog: What does 100 grams look like? 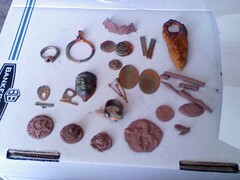 This is my latest batch of bronzclay. This is everything I made with 100 grams, not including the scrap bits left over to make slip. Some of the pieces I made polymer clay prototypes. I cant say I've actually ever done that before. I definitely need to do that again! I have a few toggles, they are easy to make, and having my own clasps Im finding I enjoy incorporating into my work. Several molded things for future bracelets or pendants, and at least 1 future ring (the maltese cross--Im making a Templar ring, going to fauxnamel the cross red). I haven't worked in a few months with lump clay--painting slip on leaves isnt the same. Its such a wonderful feeling, and then the results. Im amazed every time. And more than half the time I fall in love with the kiln patina. Silver doesn't do that! I made a gauge so I can remember where the best butter yellow color occurs and the best rainbowing with in the carbon. Its fun to play with that, and then again its also fun just to see what happens. So half of this stuff is in the tumble burnishing up, the other half Im not sure what Im doing with it, and the unfired half, well (hey thats 3 halves, oops I guess I meant to say thirds) well the last bits, Im ready to dive right in and work on more today!